The Columbia-Inland Medical Pumper Car has recently been designated by the U.S. Food and Drug Administration (FDA) as non-measuring exercise device intended for medical purposes. With use of the Columbia-Inland Medical Pumper Car, children may be able to improve their equilibrium and strength of their upper and lower torso. As such, this device could be especially useful for children with special needs, such as Down syndrome, autism, spina bifida, cerebral palsy, muscular dystrophy, brain injury, pain disorders, generalized weaknesses and child obesity. The Indications for Use (IFU) of the Pumper Car, registration number 3014895737, is a four wheeled, low-center of gravity, non-measuring exercise device intended for medical purposes. It helps to redevelop muscles or restore motion to joints for patients who have an aversion to physical exercise. This device has been of special interest to schools, hospitals and clinics that serve children with special needs, as well as to parents who have children with special needs. The FDA designation means that if Pumper Cars are prescribed for medical purposes the cost may be covered by health insurance, Medicare or Medicaid. A University of Michigan institutional review board study found that the Pumper Car has significant physical therapeutic value for children with Down syndrome. Researchers Janet L. Hauck, PhD and Dale A. Ulrich, PhD published their findings online on June 26, 2015 in Research Quarterly for Exercise and Sport. They noted that the Pumper Car, “…provides a practical method of promoting health‐enhancing behaviors in young children with DS [Down syndrome] and should be considered for clinical application by service providers.” For these children in the study, the mean time spent in moderate to vigorous physical activity (MVPA) increased from 7.8 minutes with the baseline equipment to 22.0 minutes using the Power Pumpers—an increase of 182%. “The increase seen in MVPA from baseline to the [Pumper Car] sessions is striking,” according to the researchers. 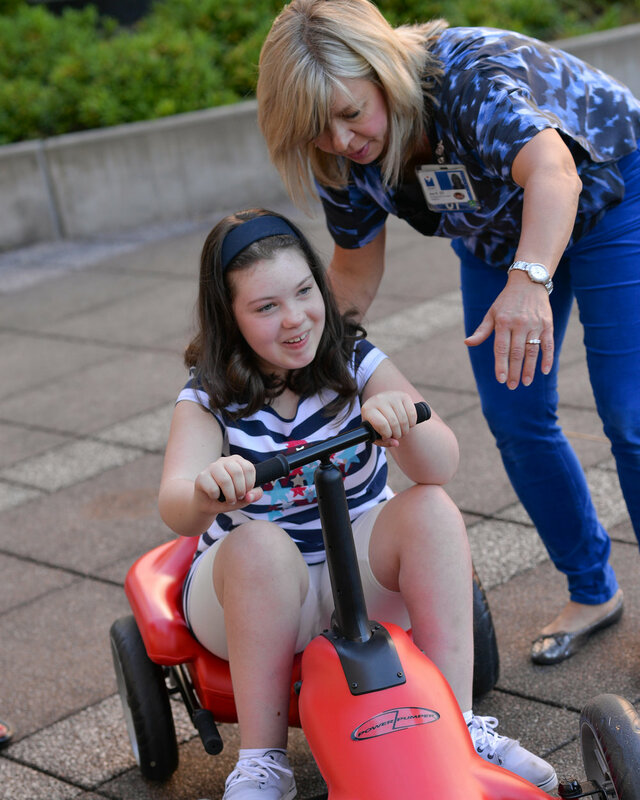 Columbia-Inland Corp. designs and manufactures high‐quality mobility products for children. They are passionate advocates for children of all abilities getting more exercise, for improved health and physical therapy. Pumper Cars are sold directly from the company. Click here to connect with our Shop page.